Industrial high pressure duct blowers, high temperature duct fan ventilators, centrifugal and axial inline fans, roof / wall exhaust and air intake fans and inline duct ventilator blowers. Saleds of industrial tube axial and high pressure vane axial fans. 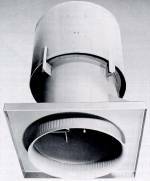 Duct fan: axial flow through fan designed for low pressure building ventilation and industrial process application. Fan uses include heat, smoke, and fume removal; process ventilation and process air handling; proces drying with ambient or preheated up to 650 F air; comfort process cooling and general ventilation of buildngs. Available in direct drive arrangements 4/4M/4V/4D/4R and corresponding belt drive arrangements 9/9M/9V/9D/9R. Capacities: to 350,000 CFM. Static pressure to 1.5 inches water gauge. Fan shaft seals: shafting is straightened to close tolerance to minimize "run-out" and ensure smooth operation. Fan bearings are of pillow plock, or flaged bearings. Ceramic shaft seal and lubricated shaft seals (Buna, Teflon, Viton) are standard. Red silicone gasketing is used on high temperature ventilator applications. Aluminum wheel, Steel wheel, or Alloy fan wheel: duct fan for non-sparking x-proof applications is supplied in AMCA A, AMCA B, or AMCA C spark resistant construction in all aluminum welded construction, or in monel. For corrosive environment duct fan is supplied in 304 SS, 316 SS, or 316 L stainless steel construction. For chemical process applications duct fan is available in fiber reinforced plastic frp construction, or in polypropylene construction, or in plastic. For high temperature applications up to 650 F duct fan is supplied typically in steel welded construction. Cladding for sound attenuation and blower silencers: cladding consists of 2 inches mineral-wool insulation covered with a welded steel jacket. Acoustic cloth jackets are available as inexpensive alternative. Inlet silencers / outlet silencers are supplied with matching flanges. Fan inlet vane damper assembly: external inlet vane damper is provided for precise air volume control. Standard fan accessories:flash / raised access door, inspection port, drain and plug, 3-way drain, mount feet, belt guard, motor cover, spring vibration isolation, rubber-in-share (RIS) vibration isolation, vibrating pads, electrical actuators, pneumatic actuators. Repair of industrial radial ventilators, fan wheels, blower impellers, stainless steel ventilators, combustion pressure blowers, high temperature industrial ventilators, material handling blower fnas, paddle radial ventilators / fans, high temperature oven ventilators, compact blowers, blowoff fans blowers, blower blade impellers, SST blowers & fans, wall exhaust blowers, duct ventilators, roof / wall supply ventilators, industrial high pressure ventilators, stainless ventilators, explosion-proof fans, replacement ventilators. Engineering sales of air knife blowers, blow off fans, stainless steel fans and SST blowers, spark resistant ventilators, combustion blowers, vane axial / tube axial blowers, high pressure ventilators, sealed blowers and fans, FRP fiberglass ventilators, ventilators, propeller fans, exhaust silencers, air / gas exhaust systems. 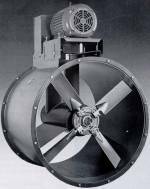 Canada Blower is a leading North American supplier of industrial ventilation equipment: all types of industrial process and OEM blowers, general building ventilation fans, mancooler ventilators. We are experts in industrial process air and gas moving and heat transfer equipment. Canada Blower specializes in high temperature industrial oven and furnace circulating fans: heavy-duty plug fans and high temperature air kits; combustion pressure blowers, pneumatic conveying fans and vacuum blowers, dust collection and fume extraction fans, severe duty material conveying blowers with paddle wheels, building ventilation wall and roof exhaust and air supply ventilators, fans for air make-up air-handling units, industrialheated and non-heated air curtains and environmental air barriers, industrial process air knives, air canons and blow-off air systems for industrial process colling and liquids blowoff, corrosion resistant and chemical resistant fans for chemical, food, gas and petro chemical industries, spark-resistant fans and explosion proof ventilators, industrial flue gas exhaust fans and emission control blowers, energy recovery ventilators, air-make-up airhandling units, industrial process heating and cooling equipment, heat transfer fans and energy recovery ventilators, industrial process and general air-handling heat exchangers, finned coild for cooling and heating, power steam humidifiers. Canada Blower is a North American distributor of industrial OEM fans, blowers, ventilators, as well as fan components: blower impellers, high temperature fan wheels, ventilator blades, fan housings, fan shaft and bearings coolers; super high temperature furnace fans, super high pressure gas and air transfer blowers, dust collector and fume extractor fan components, industrial vacuum systems blowers, high air velocity and high pressure air knives, fume and gas wet scrubber high pressure blowers, positive-displacement / multi-stage / side channel regenerative pressure blowers, large building air circulation fans, duct ventilators, inline axial fans, centrifugal blowers with various wheel designs.